This website is what Judy and John Collins know now to be true as of August, 2018. Because the early growth of triathlon depended largely on publicity and hype, much of what you find here will probably contradict what you have heard. In most cases, it will be less outlandish and more mundane than the legends. However, remember that we were actually there!! This section is written by John and addresses the legend of the creation of the Ironman. In 1978 Judy and I put on the first Hawaiian Iron Man Triathlon. The concept for this long-distance event emerged in 1974. Our family had been participants in a short ten-leg run-bike-swim at Mission Bay, San Diego, California. The San Diego Track Club called that event a triathlon. I was interviewed by telephone in 1983 regarding the origins of “Iron Man.” My answers were off the top of my head about a Monday evening 6 years before. The interview appeared in the 1983 Race Program for the Ironman Triathlon in Kona. In that interview I answered all the questions in the first person (singular). My statements made it appear that the idea emerged, full-blown, in my mind at a drunken party of macho males. I helped that interpretation along with quotes such as, “after a lot of beers…” and, “the whole thing got a big laugh.” Actually, at the awards meeting in question, the drink for the attendees was one small paper cup of beer or orange drink as we filed in to the area. The nitty-gritty facts are that Judy had been discussing putting on an endurance triathlon in Hawai’i for some weeks. She and I had been put in charge of the 1977 Run-Swim which was now 12 days away. Judy did not want us to be in charge of the Run-Swim sprint again. She wanted us to volunteer to put on a long distance triathlon in 1978 for the non-sprinter runners and swimmers who did the Waikiki Roughwater and the Honolulu Marathon each year. The location and distance of the bicycle leg were not obvious. My contribution was to use most of the road bike course from the annual long-distance event of the local bike club. Much has been made of “THE CHALLENGE” supposedly issued at a running relays awards meeting. For six years I believed that I had been heard to speak during the intermission. Since no one had heard me no one told me they had not heard me. The space was so noisy that we have not been able to find anyone who can remember hearing it. I did tell Judy what I had said after I returned to the table. She and our swim friends had agreed that we would make our triathlon a surprise announcement at the annual banquet meeting of the Waikiki Swim Club. Judy was less than happy that I had let the cat out of the bag. Then she realized no one could have heard me. 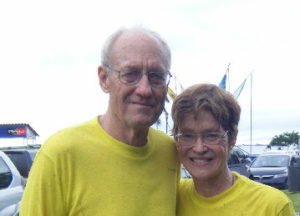 The two of us unveiled our Around the Island Triathlon at the swim banquet in October. There was a lot of laughter when we gave the details about our new event. In the 1983 interview, I gave no credit to anyone except myself. I did not deliberately cut anyone out of the story. I was responding to the questions asked and expanding on themes from my own experience and memories. I did not think about the contributions of anyone else. This is what was NOT the Ironman story: It was not the idea of one person, not a dare, not a test, not an argument, not a Navy Seal idea, not an announcement that was heard at the relay awards, not a party occasion, not fueled by beer, not entered by athletes who were not in shape, not considered impossible by the athletes and not considered impossible by those in our circle. Some of the salient sentences and lines from the 1983 interview and the resulting article made good copy. The content was eagerly grabbed by subsequent writers to become the default origins story. All the work to plan and put on the Honolulu triathlons also sounded like a one-man show. I did not try too hard to correct or to add facts and details that included others, especially Judy. Now, 35 years later, any account that does not begin, end or hinge on “THE CHALLENGE” is considered heresy. I accept the responsibility for that. Later we did tell our Two Founders story again and again. It fell on deaf ears. There was a willingness by media to seek the most colorful or outrageous phrasing or to say or write what was said last year. “What was said last year” ended up on the internet and on Wikipedia as gospel. What we had come to call the “Media Myth” wherein I am the sole founder of the Ironman event can be traced back to that 1983 interview. I gave many speeches and interviews over the following years. I repeated the same things in the same ways. Beginning in Kona in 1983 Judy had always thought that I was interviewed because I was the only one of the two of us who was a Finisher in the Hawaiian Iron Man Triathlon in 1978. She was surprised to see that the Kona accounts used my military rank. We used only first and last names in sport. Part of the media mystery was solved for us in 2001. That was when we learned that Kona Ironman Legend Valerie Silk had no idea that it was the two of us who had created the Ironman. That was news to us! In 2002 we flew to Honolulu for Ironman Revisited. That was the first time that we opened our boxes of papers from the 1970’s in Honolulu. That research triggered our memories of what had led us to create the Hawaiian Iron Man Triathlon. If I could do it over, I would give a much more inclusive accounting. It would give credit to Judy for being the impetus behind bringing triathlon to Hawai’i and endurance triathlon to the world.